Your outdoor dining or entertaining space won’t be inviting if the surrounding area doesn’t look its best. With artificial turf, you can have a beautiful yard without wasting time and money fighting the Tucson climate to keep grass healthy and lush. Artificial grass looks like natural grass, and it is soft and comfortable to walk on. However, it doesn’t need to be watered or mowed. Occasional rinsing and raking are all it takes to turn an artificial turf lawn into an attractive backdrop for all of your gatherings. 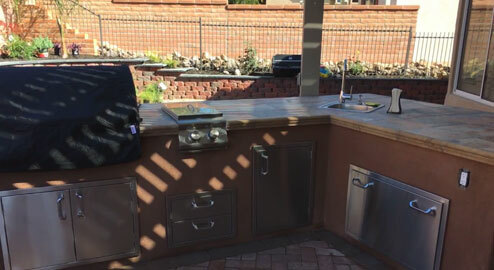 If you want to serve meals outdoors, you will need a dining area, and a paver patio is an ideal option. Pavers are low maintenance and come in a number of different shapes, sizes, and colors, so you can create a patio that blends seamlessly with your home’s exterior design. Create a space big enough to set up a table with plenty of seating so that your guests feel comfortable enough to linger. Don’t forget to add outdoor lighting for nighttime meals and cocktails. A few finishing touches will make your outdoor gatherings the most popular events in town. One feature to consider is a fire pit. Even on cool evenings, a fire pit makes sitting outside attractive and will encourage guests to settle in comfortably. Another fun feature is a putting green that is designed using artificial turf. Your family and friends will love lining up for a turn on the green. Let A New Creation help you bring your vision of an outdoor dining and entertaining space to life. 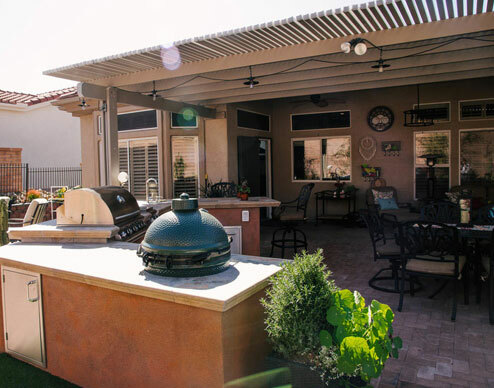 Our artificial grass installation in Tucson is the perfect starting point, and we can also help with fire pits, pavers, putting greens, planters, and much more. Start the design process today by calling (520) 730-3299.